Some of you may already have seen my 8mm rod parts for the SmartrapCore standard version (thingiverse). I have been adapting more parts to suit my needs for the experimental version I have designed. Since Smartfriendz released their ALU version and upgraded standard version to Onshape, I have been playing with them while learning Onshape. The experimental part of this is to see if a design with cheap 13mm square Alu tubes from Hobby King would work for a cheap and easy to assemble SmartrapCore version. While I like the Smartfriendz design very much I found that, for the size of the box, the buildvolume could be a little bigger. I felt the newest itteration lost some width in the X axis. I designed the corner braces for the bottom and top. The ones on top have both the steppers and XY_bearings_LR integrated. Designing and using these parts, I was able to get a 250mm X axis buildplate size (300mm between the YSlide_L and R minus the 50mm of the Head part). The printer is not completely finished yet, but I started a thread and see what you think about it or maybe incorporate suggestions and/or ideas you all come up with. I will update when possible and share the parts on both Thingiverse and Onshape for you to use or remix. Edited 2 time(s). Last edit at 09/27/2015 12:49PM by 3DFreezeMe. Thanks Mike! The comment you made catalyzed my thinkingproces completely! While I was solving the X axis width problem, I had to make changes to the belt path to make that happen. Also, the initial tube corners I used did not offer the sturdiness for the top I hoped for, even with the braces already in use for the bottom part of the frame. As you did not answer my reply on Thingivers, I had to assume that you would like to see a solution like I now have created which seemed the most obvious. I just had to put one and two together! I have now used (natural) PLA for the parts and find it, although stiff enough, too brittle. It splits too easily when assembling. The pink parts I showed on Thingiverse were to finish a role I had laying around and were perfect for testing several itterations of the parts and as POC. When final, I am going to either print them in ABS or PETG. I designed all parts with external sides with a 3mm thick outer region, so enclosing the printer should be very easy. I had the same concern about the new y-axis sliders. They take 30mm from the x-axis. My small 100*100*100mm^3 smartcore would grow down to a 70*100*100mm^3 printer with the new parts so I went to the drawingboard (sketchup not onshape yet) and designed a core-xy that has been in my dreams for a long time. The bearings are 624zz nearly same size as the pulleys. XY-motors are nema-11. The printing area is 195*220*200mm^3 In my opinion close enough. Seems like a nice solution you came up with. 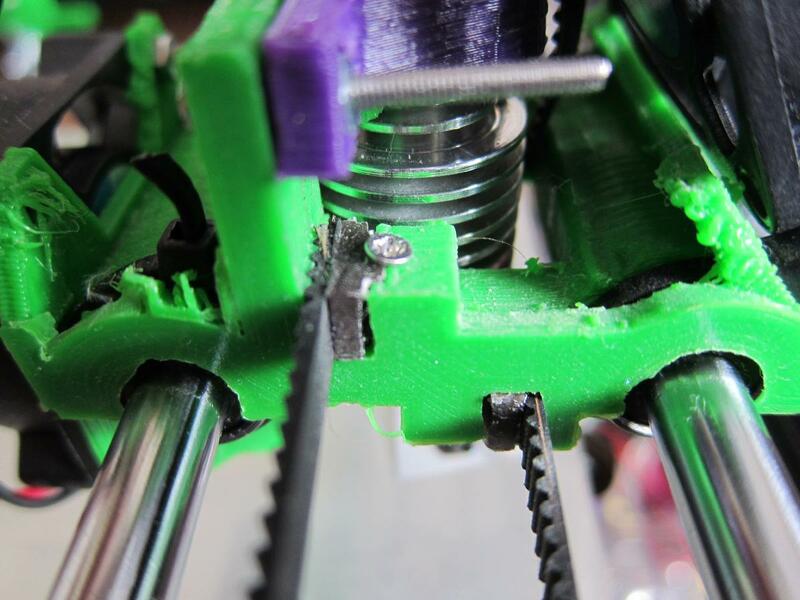 Love the reuse of the old Dutch Reprap (even if it is a lookalike)! How are the NEMA11's holding up, what kind of speeds can you print at? Looks like a nice project to make a nice small desktop printer based on CoreXY. When you can invest some time in Onshape, it will be a much better tool for designing for 3D printing then Sketchup. I made the switch after using Sketchup Pro for a long time, and do not regret it. I'm always so happy to see people hacking and evolving the models.. it's so positive and also usefull : I've used a lot of ideas from the commmunity for the smartrap, the core and certainly will do for the alu version too . Hi, im arieljn, the one who commented on thingiverse, when i saw the alu version of the smart rap core i loved it, but its hard to get that kind of alu profiles here, then i saw your remix, and loved it, cause u use M8 instead of M6 (cheaper here too) and i kind of remixed your remix using iron instead of your HK 12.8 profiles, i think im not gonna post it as a remix cause most of parts are untouch or slightly adapted, if you want i can share you my mods on stl to add them to your great mod. the only thing i m having doubts is on the Z_Bottom piece, i cant decide why you didnt close it as Z_Top part. again, thank you for remixing the model! Hi arieljn, thanks for the kind words. The updated parts also have a closed Z_Bottom part, althought the photo's above do not show that clearly. The first version was not closed, as I was going to use a bottom mdf plate. Later decided to close it around the back to the underside of the alu tube. Currently I am preparing and cleaining up the Onshape design for release and will add a new design with these parts to Thingiverse as well. I'm trying to finish up some of my other projects. I look forward to building this in the future. Great Work! Edited 3 time(s). Last edit at 10/04/2015 04:57AM by 3DFreezeMe. New parts available for Endstops X and Y.
I have found a simple way to use Optical Endstops and a couple of pieces of a tiewrap to trigger them. - new part YSlide_Bot_X_Endstop_tiewrap has been added which replaces the YSlide_Top_Bot part, which also has a slot for a piece of tiewrap. Edited 2 time(s). Last edit at 10/04/2015 12:32PM by 3DFreezeMe. Good work. But the belt should be perpendicular between the carriage and the ilder on your y-axis. The belt will be loosen an tighten dependend of the position. Also it will move more or less depending on the position. are you sure the perpendicular problem is more with an HBOT system ? I tought it was not so important with a coreXY. Well, from our tests, we didn't noticed any problems with non perpendicular lines on coreXY . You could calculate the belt length of this part when you are at y-min and y-max. You will have a delta on this. The perpendicular-issues on h-bot is different problem. The good thing of a coreXY is, that you make your y and x-axis perpendicular while tighten the belt. But your belt is the problem, not the axis. it's absolutely critical. Wurstnase is absolutely right. what you can do to test that it is, indeed, absolutely critical, is to print nine square parts in the top left corner, top right corner, bottom left corner, bottom right corner, and the centre, as well as left, right, top and bottom. make sure that the edges line up in the four corner squares (so, left edges are at -90mm, right edges at +90mm) doesn't have to be high: just a couple of layers will do. make them saaay.... 50x50mm, and, to save PLA, blank out the centre as well, so you only end up printing 2mm-thick parts of PLA for example. then, put a ruler along the edge, at the -90mm line. you'll find that it's pretty blindingly-obvious that they're not even a straight line. the corner ones will be diamond-shaped, basically also, when you measure the size of the 50x50mm squares in each corner, you'll find that they're not only diamond-shaped but are larger by a noticeable and significant margin. it might even be obvious by eye, it'll be that far out. basically, the further off of true that the belts are, the greater the error. estimating from the pictures: basically instead of a straight line you've got a triangle. so the error will be based on pythagoras... when the printer is in the left corner, the angle is small enough so it's not really noticeable. when it's in the right corner however, and the x carriage is near the motor (let's say 70mm is the closest you can get), the design-flaw offset vertically of about.... 20mm (estimated from the photos) will result in... the length being a whopping THREE MILLIMETRES off what it is supposed to be. so those 50mm parts will be about FIFTY TWO MILLIMETRES in size, not 50.0, which is a pretty serious difference. notice how, when *both* belts - both the top and bottom one - come out of the X-End idler, they both turns *exactly* 90 degrees? this is ABSOLUTELY CRITICAL and it's basic, fundamental physics (and mechanics). there are three reasons why i am posting this detailed explanation. firstly, so that you can correct this design error. secondly, so that people who have been copying your design without doing an analysis can do likewise, and thirdly so that people *thinking* of copying this design can make sure that they don't make the same fundamental design mistake. (1) can i recommend that you review the Fusebox discussion, especially around this point [forums.reprap.org] - the Z-rods are far too close together (which will cause the printbed to badly wobble), and also, i too made the mistake of thinking that 8mm rods would be sufficient (because i copied the original Fusebox design without doing the research in advance). we're just discussing best-practices right now which seems to be to use 10 or 12mm rods, and we're looking at ways to stop the see-saw effect using 150mm-long aluminium L-bracket with 60mm-20mm cross-section (just as in the "G&C" all-aluminium printer), and other ideas. (3) the x-ends look great, they should be very sturdy. i have just converted to vertical rods, and i am saving space so have quite thin x-ends where the X rods come out. 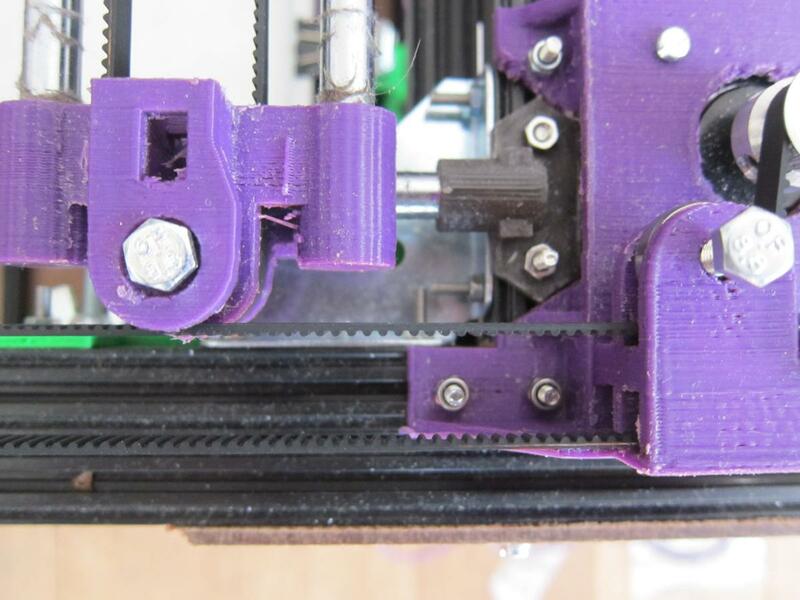 (4) holding the belts on the carriage, have you considered the trick below (M2x5mm nut and bolt), it means that variations in belt thickness (even between the same supplier) will not mean throwing away 3-5m of PLA from a carriage where the fixed-distance belt-capture points are either too loose, too tight, or were not printed properly. Edited 1 time(s). Last edit at 04/23/2016 03:39PM by lkcl. Hi Ikcl, thank you for your extensive explanation regarding the issues with the alterattions I made to the SmartrapCore design in my version. Much appreciated! And of course Wurstnase for addressing the matter. I had totally forgotten about his thread, have not been printing and designing for a while (follow topic and mail notifications were off). On Thingiverse, I have updated the description of my design to warn people about the issue with it. I made the mistake trying to create as much effective build volume within the boundaries of the cube, while not taking into account some basic ground rules for CoreXY. Not having any knowledge of either mechanics or physics made this possible. I will get back to the drawing board with the tips you have provided! This seems like it would be the perfect blend of 8mm rods, corexy, and cheap frame that I was looking for. Sadly I dont quite see what the issue is to be able to fix the design my self. Is anyone able to modify the design to correct for the errors? This printer seems similar would it suffer from the same issues or does it address the belt issues that you mentioned? Edited 1 time(s). Last edit at 08/22/2016 04:48PM by mindstormmaster1. That was also my thinking, by adapting the original Smartfriendz version to my needs. For the z axis I did already design a dual version using two leadscrews and two motors (also not ideal). This was not updated here and on Thingiverse. Currently I am working on parts which make the belts run perpendicular, but this will come at the cost of almost 50mm less build volume in the X-axis. A possible solution I found was recently posted by PDBeal. I am now adapting this to my corner braces for the HK13 alu square tubes. See the attached screenshot for some progress. Edited 3 time(s). Last edit at 08/23/2016 07:16AM by 3DFreezeMe. That new version looks great! I am excited to hear that you are willing to keep working on the design! Please keep me in the loop as I hope to order all the parts I need soon. Why does everyone hate on the z axis as it was originally designed? The ultimaker uses is very successfully. I understand that 8mm rods are not strong enough, but wouldn't 2-12mm rods be cheaper than 4-8mm rods? Thanks for your interest. I made myself a promise to finish it, I started after all. Just read all and take note about the best practicesand use from it what is best for your situation. I also want to try different versions and techniques. Kind of learning while doing. Making mistakes is part of the experience. Taking an existing design and adapting it to your needs and/or wishes is also the best way to learn Onshape! Edited 1 time(s). Last edit at 08/23/2016 04:02PM by 3DFreezeMe. Would you be willing to post your designed to Onshape so that I can mess with them? If you want to make some changes first I understand, but I would love to collaborate with you in you are interested! What you have seen already is from within Onshape. My design is public, so feel free to make a personal copy and mess with it however you like. With this in mind I tried your test and you're right the squares at the corners of the bed are not square but parallelogram. However I have a plan for the smartrapcore which might kill two birds with one stone. The idea is to use 2 sets of the pulley holders the original set at the back and a second set at the front. I intend to use my double supported design [www.thingiverse.com]. Remove the motor mounts and motors from their current location. Now the belts will run 90deg between the y section and the x section, and parallel to one another. Now I intend to design motor mounts with tensioners built in so solving the problem of awkward belt tension adjustment as well as non-square objects at the extremities. I have been playing with that idea as well and already incorporated the double supported design for the set in the back, as you can see in the screenshots above. By off-setting the bottom and top idlers, the belts do run parrallel and perpendicular where needed. The belts cross each other in the back this way. As said in a previous post, I got that idea from PDBeal who added that to your double supported design. Your idea of adding this in the front section will be giving back some of the lost build volume in the X direction. Ikcl did exactly this in his Sandwich200v1 design, as his first screenshot posted above shows. I will be looking out for your new motor mounts as well, with the belt tensioning built in. I'm printing the second one now, they feel strong enough in petg, the motor fits, it's whether I've got the pulley geometry right, also the smooth rods might be too short, I've got some longer ones from my now deceased i3, can't wait to fit them and see how it works. Sorry about the rough print with PETG I still haven't really dialled it in yet - doesn't matter its as strong as hell. Edited 1 time(s). Last edit at 08/28/2016 06:04AM by DjDemonD. Can you explain to me how having the double rear pulley regains lost x-dimension? I can see the argument for making the y-carriages much narrower in x and re-orientating the rods to the horizontal not vertical. Edited 1 time(s). Last edit at 08/28/2016 06:12AM by DjDemonD. I was talking about the front double pulleys you suggested. When using them and thus bringing the belt path wider (and not using the motor pulley directly), you have the possibility of moving the y slider pulleys more to the outside as well and thus having longer X rods. Originally I thought about having a single front pulley/bearing supported on a pulley holder and making the motors engage the belts at the sides, the one which runs from the front to the back pulley holders (not the belt to/from the y carriages) but this would have needed the motor mount to have double smooth pulleys to wrap the belt around the drive pulley, so was just too fiddly. realigning the front drive pulleys to restore the 90 deg belts and building in tension adjustment on the motors seemed to be the neatest way to solve these two problems.